Increasing water temperatures are responsible for the accumulation of a chemical called nitrite in marine environments throughout the world, a symptom of broader changes in normal ocean biochemical pathways that could ultimately disrupt ocean food webs, according to new research from the University of Georgia. Nitrite is produced when microorganisms consume ammonium in waste products from fertilizers, treated sewage and animal waste. Too much nitrite can alter the kinds and amounts of single-celled plants living in marine environments, potentially affecting the animals that feed on them, said James Hollibaugh, co-author of the study published recently in Environmental Science and Technology. It also could lead to toxic algal blooms and create dead zones where no fish or animals can live. "Rising ocean temperatures are changing the way coastal ecosystems—and probably terrestrial ecosystems, too—process nitrogen," said Hollibaugh, Distinguished Research Professor of Marine Sciences in UGA's Franklin College of Arts and Sciences. "Much of the global nitrogen cycle takes place in the coastal zone." Hollibaugh and researcher Sylvia Schaefer found midsummer peaks in concentrations of nitrite alongside massive increases in numbers of the microorganisms that produce it in the coastal waters off Sapelo Island, Georgia, in data collected over the course of eight years. Although most researchers believe nitrite accumulation is a consequence of oxygen deficiency in a marine environment, Hollibaugh and Schaefer thought something else had to be driving the accumulation. "The paradigm taught when I was in school was that hypoxia, or lack of oxygen, results in nitrite accumulation," Hollibaugh said. "But the Georgia coast does not go hypoxic. It just didn't fit." After performing lab experiments that exposed the single-celled organisms known as Thaumarchaea to varying water temperatures, the researchers discovered that higher temperatures prompted the microorganisms to produce more nitrite. "The microorganisms involved in this process are very tolerant to low oxygen levels," Schaefer said. "Typically, two groups of microorganisms work in really close concert with one another to convert ammonium to nitrate so that you don't see nitrite really accumulate at all, but we found that the activity of those two groups was decoupled as a result of the increased water temperatures." To see if the pattern held beyond the island, Schaefer and Hollibaugh analyzed environmental monitoring data from 270 locations across the U.S., France and Bermuda, ultimately affirming the relationship between higher temperatures and nitrite accumulation. This dependence on temperature wasn't appreciated by the research community until now, and it can have widespread consequences even beyond coastal water quality management, Hollibaugh said. "The same process, though we didn't look at it specifically, takes place in regards to fertilizing soil for agricultural purposes," he said. "It affects farmers and their efficient use of fertilizer—when they should apply it and what form it should be in—and ultimately much of that fertilizer will end up in the waterways, which can lead to algal blooms that choke out other species." 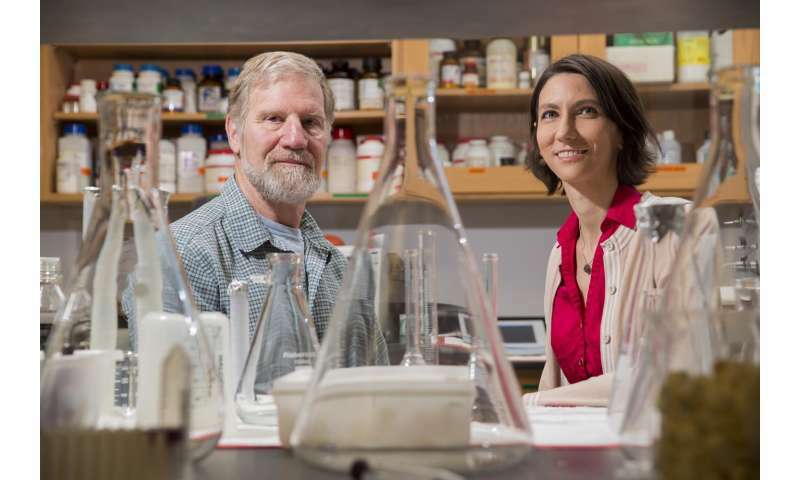 Nitrite accumulation can also result in more production of nitrous oxide, a powerful greenhouse gas that has more of an effect on climate change per molecule than carbon dioxide, Hollibaugh said. That nitrous oxide production then increases global temperatures more, causing more nitrite accumulation and creating a positive feedback loop. "If you live on a marsh and look out over the water, you're probably not going to notice it, but if you like shellfish, like to fish, like recreational water sports, then these findings do matter," Hollibaugh said. "The information gained from monitoring programs, like the ones we used to analyze temperature and nitrite data across the country and in other countries, can be used not only to forecast what is going to happen down the road and the longer-term consequences of management decisions, but also to come up with potential solutions for the problem. The data collected by these programs are important for wise management of our resources." It is amazing how many different ways Global Warming is going to kill us. Seems like a new doom is discovered every month or so. We should have some kind of test to see if one understands the issues sufficiently to respond. Political activist scientists that produce fake climate science should not be funded. I agree, but the political activist "scientists" producing fake climate science (Curry, Christie, Spencer, anyone associated with Heartland Institute) are supported by the Republicans and that's who controls the purse strings right now. The actual scientists will be busy for a while pointing out the errors, deliberate or not, in these "scientists" papers. Where is the chart showing the increase in temperature over 100 years? "Rising water temperatures endanger health of coastal ecosystems, study finds"
"After performing lab experiments that exposed the single-celled organisms known as Thaumarchaea to varying water temperatures, the researchers discovered that higher temperatures prompted the microorganisms to produce more nitrite." Which proves their point that rising water temperatures endanger health of coastal ecosystems, so why would they need to show a chart showing the increase in temperature over 100 years? @SteveS.. In 1850 how many temperature stations where there monitoring the ocean temp and where were the temperature station locations? As compared to today's location and number of ocean temperature stations? Are you looking for ways to discredit the work of scientists? They are way ahead of you. 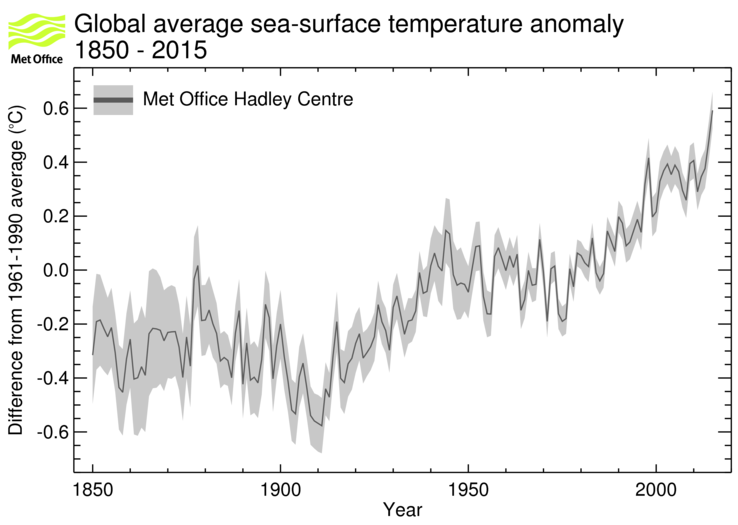 From 1945 to 2010 shows a 0.3 degree increase in ocean surface temp, that's not a lot? It is a lot of heat. From 1910 to 1945 there was a 0.7 degree rise in temp, why so much of a rise in temp ? I admire you chutzpah, most people would be ashamed of such blatant cherry picking. Religious folk who try to debate science have no idea how they sound to the educated. I suppose as waters warm, existing ecosystems will sicken and die and just as quickly be replaced by systems more suited to higher temps. IOW systems will migrate northward. I am sure this has happened in the past? You're quite right. They've been a great job of discrediting themselves on their own.